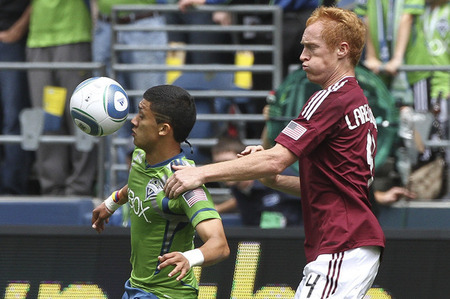 This weekend the Rapids head to Seattle to face the Sounders. This game has all sorts of storylines you can write, but none will be greater than Brian Mullan playing his first match in Seattle since last year’s incident. Now everyone has their own opinion about it and I am sure the supporters in Seattle will clearly state theirs on Saturday afternoon. have all read some sort of blog or article trying to state otherwise. But if you have ever met Mullan you would understand he is a great guy who is deeply family oriented that plays the game with such high intensity and passion it can be seen by even a “casual” fan. Reality is, the Rapids aren’t going to Seattle worrying about the fans, the players, or what anyone else thinks about what has happened in the past. They just want to play a competitive match and get three points. The Rapids are eyeing the return of Conor Casey to their lineup next week. So I’d expect a lineup much like last week against RSL. I haven’t been able to catch up on any Seattle Sounders games so my G4S buddies in Seattle may have to brief me on their possible lineup. These games are always fun to watch as the turf in Seattle really does speed up the game. I also like playing the Sounders because I get to watch several players who are very attractive and who are also on our Allies list. I’ll go out on a limb and predict a 2-1 score, where no one better than Brian Mullan scoring the game winning goal. Colorado Rapids: Our Leader. Our Captain. What’s Next?